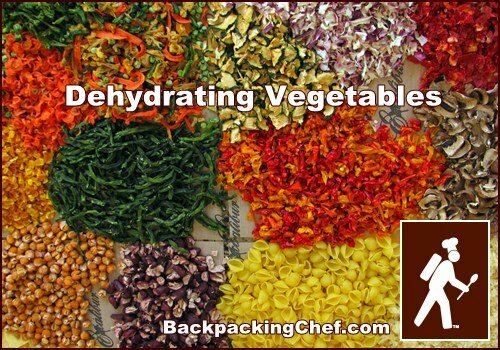 Dehydrating vegetables will make your trail meals super nutritious and colorful. A medley of red, yellow, orange and green bell peppers in Mexican Beef & Rice makes it festivo delicioso. Include one or several vegetables in each meal. Tuna Mac Casserole tastes just as good with a medley of corn, carrots, peas and green beans as it does with just peas or diced tomatoes and mushrooms. Dried tomatoes, onions, peppers and mushrooms go well together in meals. There is no need to cook a vegetable before drying if it is one that you would eat raw in a salad such as pepper, tomato, mushroom or onion. 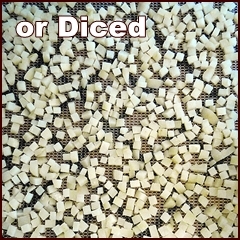 All you have to do is clean, cut uniformly and spread in a single layer on dehydrator trays. You can go either way with carrots, but steaming them will turn them a nice dark orange when dried. A vegetable that you would normally cook before eating such as corn, peas, broccoli and green beans will usually rehydrate better if you steam them for eight minutes before drying, but it is not always necessary. It depends on how you will cook them on the trail. If heating over candles as a side item where the temperature doesn’t reach a boil, steam for eight minutes before drying. I always warm up a side of vegetables in a fry pan lid with the main meal. 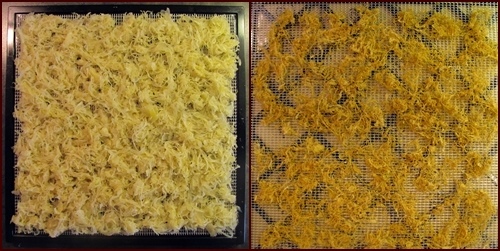 Above: Dehydrating Vegetables for Sides. Each 3 x 5 inch bag holds 1/2 cup which I heat and rehydrate to go with the main meal. L to R: Broccoli & Onions with Black-eyed Peas, Corn, Peas, Ratatouille. If rehydrating in a freezer bag by adding boiled water to the bag, steaming the vegetables for eight minutes before drying will give you more tender vegetables than if dried raw. Steaming corn for eight minutes before drying makes it more digestible in trail meals. Steam frozen mixed vegetables if they include corn. Avoid drying mixed vegetables with lima beans because they rehydrate poorly. Cooking vegetables in a stew is another method of dehydrating vegetables. 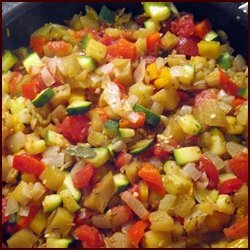 My Ratatouille recipe includes eggplant, onions, peppers, zucchini and tomatoes. I serve it as a side or as a main meal with rice. When dried, the color will be darker. The drying times listed below are based on my experiences using an Excalibur Food Dehydrator. Dehydrating vegetables may take more or less time with other dehydrators because designs and wattage differ by manufacturer. Humidity also affects drying times so your results may differ from mine depending on the time of year or where you live. Dehydrated sweet or white potatoes are a little too hard to snack on. They are chewy when rehydrated in meals but soften with longer simmer times or in soup that cooks for a while. Peel potatoes (optional) and cut longwise into halves for small potatoes or quarters for large potatoes. Slice crosswise ⅛ of an inch thick like scalloped potatoes or dice into ⅜inch cubes. Steam or boil for ten minutes. Allow to cool and place on dehydrator tray in single layer. Apply salt if desired. Dry at 125° for six to eight hours. Potatoes will be hard when dry. Enhanced flavor variation: After cooking, soak sliced potatoes in balsamic vinegar and salt for ten minutes before drying. See Dehydrating Potatoes into Bark for instructions on how to turn mashed potatoes into potato bark. Wash tomatoes to remove pesticides. Cut out the hard spot where the tomato was attached to the stem. There is no need to remove the seeds since the gel-like substance around the seeds has health benefits. Slice tomatoes four or five times across and then dice the slices into pieces. Shoot for about a ½ inch square, but you will have plenty of variance from the target size. 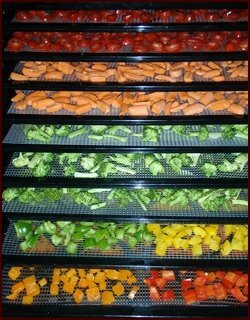 Spread out in a single layer on dehydrator trays covered with non-stick sheets. Include the juices to maximize the nutritional value. Shake a little salt on the tomatoes if desired. Dehydrate tomatoes at 135° for approximately eight to ten hours until dry and leathery. Dried tomatoes are bendable, not brittle. You can start out at 145° for the first two hours to speed things up. Stirring the tomatoes every few hours helps to dry them evenly and will shorten the drying time. Cherry tomatoes can be cut into ⅛ inch thick slices using a sharp knife. Dehydrate the same as diced tomatoes. Since sliced cherry tomatoes maintain a fairly uniform size and don’t drip too much after the initial cut, you can dry them faster without a non-stick sheet. However, tomatoes may stick to some dehydrator trays so you may elect to use a non-stick sheet. You can also quarter cherry tomatoes and dry with the skin side down, but be careful that the inside is fully dried before storing. Take advantage of the color possibilities of peppers to brighten your meals. Wash and cut peppers into ½” pieces, trimming away the white fleshy part on the inside. Place cut peppers on dehydrator tray in single layer with the skin side down and dehydrate at 125° for approximately six to eight hours. Wash peppers and cut into rings crosswise. The fleshy inside part and seeds can be removed or included for more heat. Dry in a single later at 125° for approximately six hours. Use with caution as the heat concentrates in the dried pepper. Use two to three slices per serving in meals where you want some heat. Peel off outer layer and dice onions into pieces about a ½ inch long. Separate any layers stuck together and spread out in a single layer on dehydrator tray and dehydrate at 145° for two hours. Reduce to 135° for six to eight more hours or until pliable. Move the onions around every couple of hours to speed up drying. Onions may stick to trays when drying. 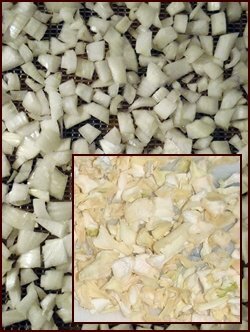 Using non-stick sheets or parchment paper may help if you have this problem with your dehydrator, but try to dry onions directly on the mesh trays. Onions smell pretty strong when drying, so you might want to open a window. Baby bella or small white mushrooms are good sizes to dry. Wash the dirt off in cold water, cut off the ends if hard or brown, and cut mushrooms into ⅛ inch thick slices. Place on the dehydrator tray in a single layer and dehydrate at 125° for six to eight hours until dry and leathery. Mushrooms absorb flavors well. To make savory mushrooms, heat 1 cup of water with a ½ cube of beef or vegetable bouillon in a pan. Bring to a boil and then remove from heat. Add one pound of sliced mushrooms to the broth and stir around for a few minutes. 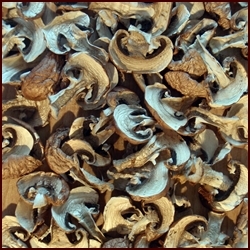 Savory mushrooms take about an hour longer to dry than uncooked mushrooms. Wash zucchini and remove any dark spots on the skin. It is not necessary to peel zucchini before drying. Zucchini is tasty in a meal combined with tomatoes, mushrooms and onions. For use in meals, cut zucchini into ⅛ inch thick slices and then cut the slices into quarters. 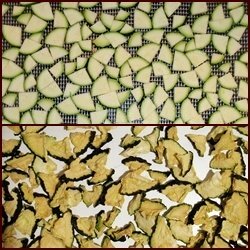 Skip the quartering if drying zucchini into chips for snacking. Dehydrate at 135° for approximately eight hours. Dry carrots raw or steam them for eight minutes. Carrots shrink a lot when dried, so use large carrots instead of baby carrots if you don’t want tiny carrot bits in your meals. Steamed carrots shrink more than raw carrots and will turn a dark orange. Peel and cut into ⅛ inch thick slices. If a carrot has a narrow or tapered end, that part can be shaved with a peeler or grater instead of slicing it. Dehydrate at 125° for approximately six to ten hours or until leathery. 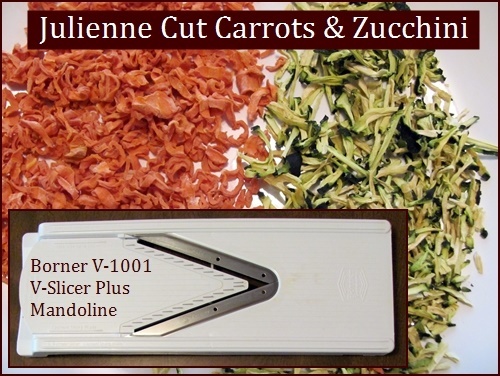 Another way to slice carrots, zucchini and yellow squash before drying is to use a julienne slicer. Even potatoes can be sliced this way. With the Borner model shown above you can make julienne cuts in two sizes. I use the smaller size for dehydrating. This is my preferred method now for slicing zucchini for drying. You can also toast the zucchini lightly under the broiler in your oven for a few minutes to give them a nice roasted flavor. View the Swissmar Borner V-1001 V-Slicer at Amazon.com. Pick or purchase green beans that are not too fat and fibrous. Wash and dry green beans. Cut off the ends and cut beans into ½ inch to 1 inch lengths. Steaming for eight minutes before drying improves tenderness of the beans on the trail if you cook over candles or in a freezer bag. Spread in a single layer on dehydrator tray and dry at 125° for approximately eight hours. Dried green beans will be hard. If drying frozen green beans, you will find that French-cut green beans rehydrate faster and are less chewy in a meal than regular-cut green beans. Soak broccoli for ten minutes in salt water and rinse to remove any insect eggs and grit. Cut the florets into smaller ½” bouquets. The stalk may also be dried. Cut half of an inch off the bottom and peel and discard the outer layer of the stalk. Cut the stalk crosswise into three sections about an inch to an inch and a half long. Turn each section on its end and cut down into four or five rows. Rotate a quarter turn and repeat so you end up with rectangular strips. Steam the broccoli for eight minutes to break down the fibrous walls of the stems and to bring out the dark green color of the florets. Place some parchment paper or a non-stick sheet on the bottom tray to catch any dried pieces of the florets that may fall through. Dehydrate at 125° for approximately eight hours. Dehydrated broccoli and cauliflower will be brittle when done. Dried cucumber chips are fair for snacking. If cucumbers have a thick waxy coating, peel first and then cut into ⅛ inch thick slices. If the cucumbers have large seeds, consider cutting the cucumbers in half longwise, scraping out the seeds, and then slicing the halves. Arrange in a single layer and sprinkle with salt if desired. Dehydrate at 135° for approximately eight hours if you want them crispy like a chip or at 125° for six hours if you want them chewy. Dried spinach tastes great in pasta or rice meals with tomato or cheddar cheese sauce. It combines well with beans and lends a nice flavor to soups and scrambled eggs. Choose fresh spinach without any dark mushy spots. Wash leaves and pat dry with paper towels. There is no need to trim the stems. Spinach leaves take up a lot of space on the dehydrator tray, so start off with the spinach doubled up in two layers. Dehydrate at 125° for approximately four hours. After two hours the leaves will have shrunk enough to spread them out in a single layer. 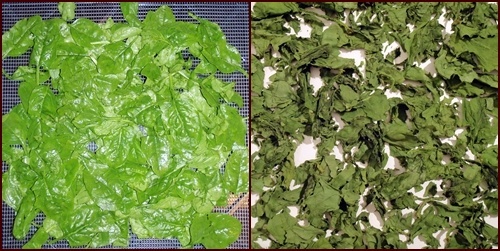 Place a mesh sheet over the spinach leaves when they are half dry because they may start blowing around. Frozen vegetables are available year round and save time in the kitchen because they require little or no trimming before drying. Frozen mixed vegetables, corn, peas, French-cut green beans and okra all dry well. Thaw and spread in a single layer on dehydrator tray and dry at 125° for approximately six to eight hours. Pre-cook only if your trail cooking method doesn’t maintain a boil for at least a minute, although corn is always better if you pre-cook it. When drying mixed vegetables, snap the green beans in half so they finish drying at the same time as the carrots, corn and peas. Lima beans remain hard when rehydrated in meals, so use mixed vegetables without them. French-cut green beans are less chewy in meals than regular cut green beans. Peas shrink a lot when dried, so dry larger peas, not the petite size. Canned vegetables are generally soft from sitting in salted water. You will get better results and retain more nutrients dehydrating vegetables that are fresh or frozen. I make an exception for beets. Beets are the one root vegetable that is easier to dry from the can than fresh since it takes a long time to cook fresh beets. Of course, if you have the time, go for the fresh beets. Choose sliced beets for even drying. 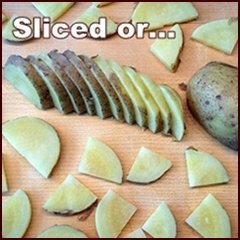 Cut any large slices into halves or quarters so that all slices are about the same size. Spread in a single layer on dehydrator trays and dry at 135° for eight to ten hours. Dried sauerkraut adds a nice little zing to backpacking meals and goes well with ramen noodles. It can even be snacked on dry. Drain liquid and spread out on dehydrator tray. Dry at 125° for approximately four to six hours until crispy. Stir once or twice. Beans are actually legumes, but I'm tacking them on here with the vegetables. 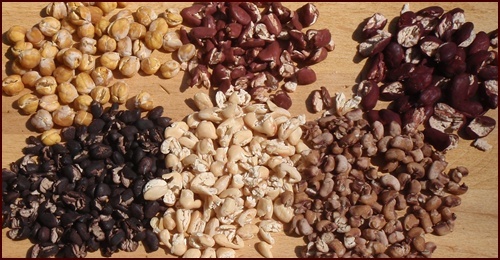 Drying canned beans saves time compared to cooking the beans yourself and produces beans that rehydrate well in meals. Home cooked dried beans stay hard and don’t rehydrate as well as canned beans. The pressure cooking method used to cook canned beans makes them rehydrate better. Drain beans and place directly on dehydrator tray. Consider rinsing first if the liquid seems syrupy. Dehydrate at 125° for six to eight hours. Dried canned beans usually split open. This helps with rehydration. 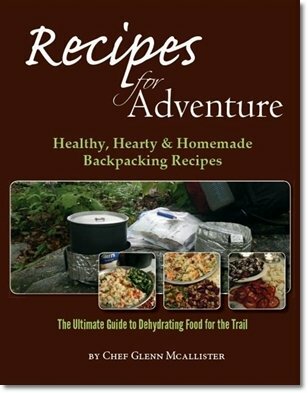 In my book, Recipes for Adventure, I devote a whole section to dehydrating vegetables which includes the dried yields for all vegetables used in the recipes. It will help you estimate how many cups of dried spinach you will get from one pound of raw spinach. The recipes in the book suggest my favorite combinations of vegetables to use, but allow you to substitute whatever vegetables you like. 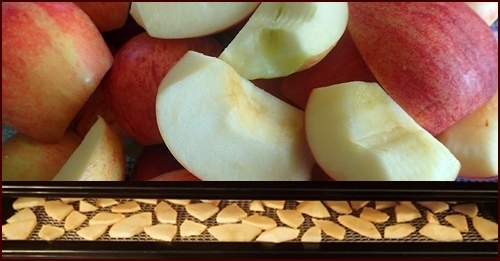 Dehydrating Apples, Pears, Bananas, Pineapples, Peaches, Strawberries, Mango, Blueberries and More!